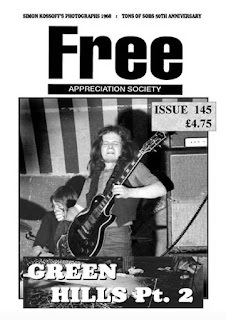 Extra Large 56 Page full colour issue covering the complete history of the band from April 1968 to March 1969. 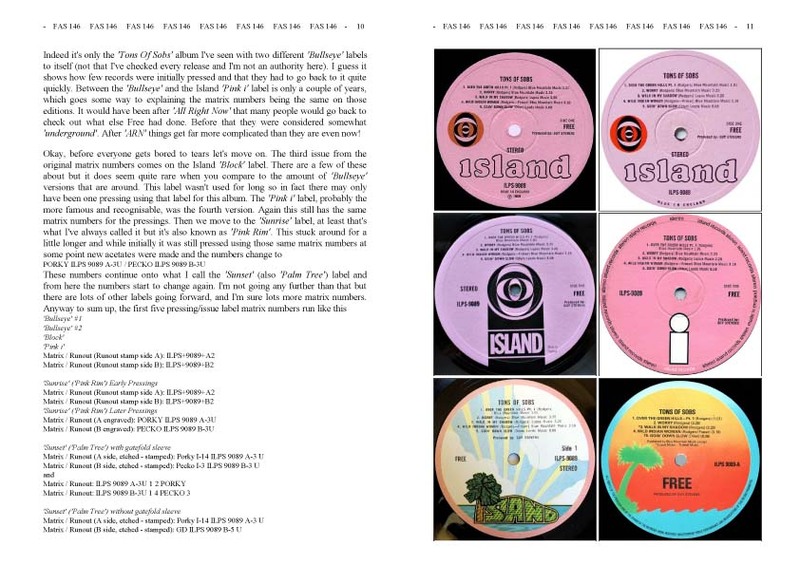 This edition is the final part of our 'Tons Of Sobs' trilogy and features the album itself as released world-wide, with information on pressings, matrix numbers and different editions across the globe. 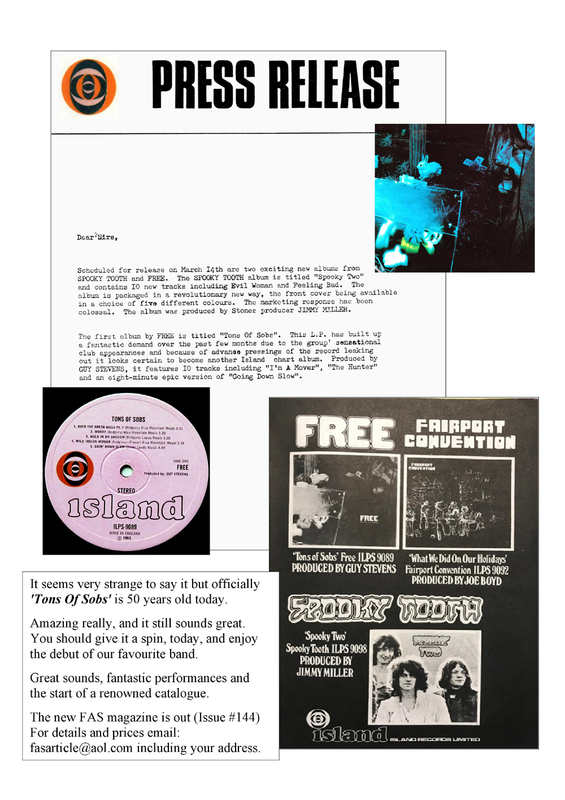 Included are press releases, adverts, foreign issues, albums, singles and compilations. The UK, USA, France, Germany, Australia, New Zealand, South Africa, Japan and Canada are all represented with information and images. Also in this fantastic magazine is the day to day diary. 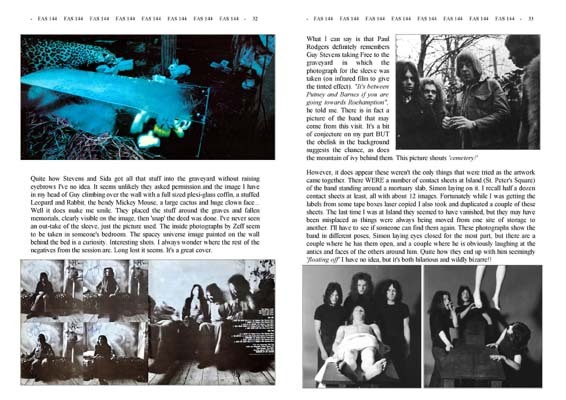 Covered here is the complete life of the band - gigs, recording and more - in a journal / sequentially dated format, similar to that in the back of 'Heavy Load'. 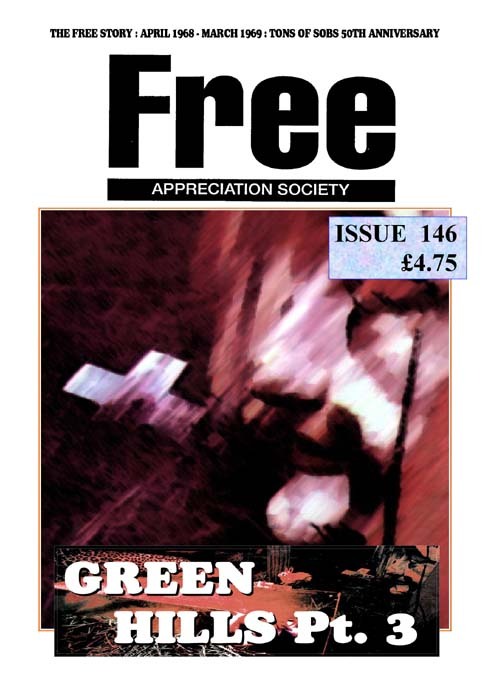 This new version is updated with nineteen years worth of additional information, along with cuttings, ads, contracts and memorabilia of all kinds. The most in depth look at this period of the FREE history EVER. This completes a trio of issues that look at this specific phase of the band evolution over #144, #145 and #146. 'Tons Of Sobs' indeed. The back cover of #146 features the original release advert for the 'Sobs' album in March 1969. Much more memorabilia, photographs. press and cuttings inside. 56 packed colour pages. Get it now!! The issues can also be found individually on Ebay but subscriptions always go out before any new magazine is made available elsewhere by a week or so. You can also buy individual issues and back issues from the above email address. with any credit card via Paypal. Its safe and easy! These anniversaries come around thick and fast. So here's the next from our '50 Years Old' list. 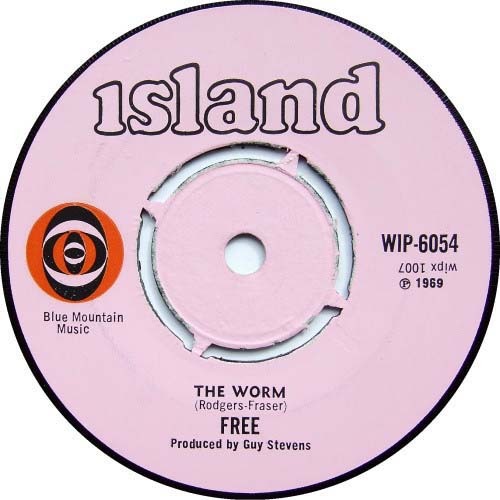 Today, in March 1969, Free's first single 'Broad Daylight / The Worm' was released. It didn't rip up the charts. It didn't set the world on fire - but it does feature one of my favourite early Free songs 'The Worm' on the flipside. 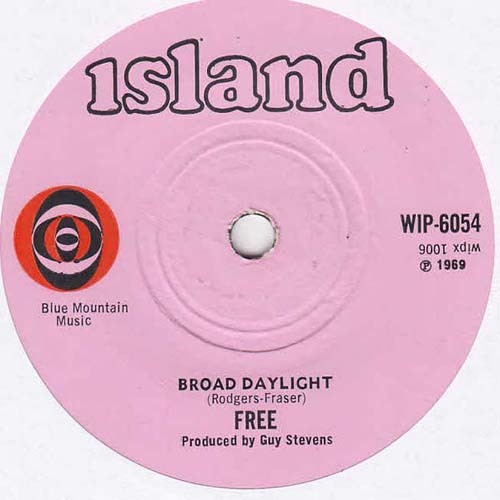 'Broad Daylight' itself has always been a bit of an oddity. Somewhat jaunty and with weird time signatures it was a one off. You can find a BBC session version of the song. Rodgers plays bass there while Andy plays rhythm guitar. 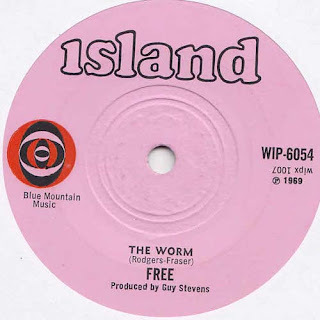 Its quite rare to find the single these days but it does turn up. Here in the UK there are actually two different pressings. If you can find either for under £50 in excellent condition you'd be doing very well. Pictures taken by Paul's brother at The Marquee in 1968. 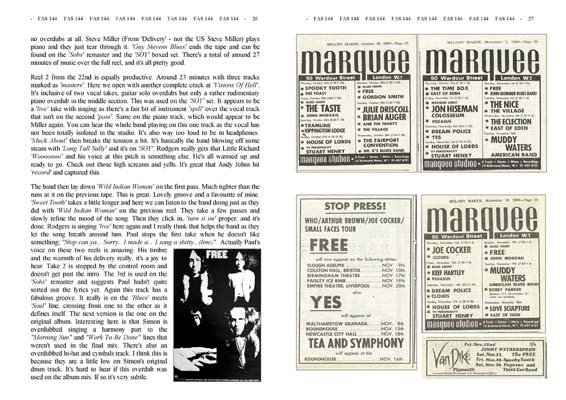 Extra Large 56 Page issue featuring the photographs taken by Simon Kossoff at the Marquee club in London October/November 1968. 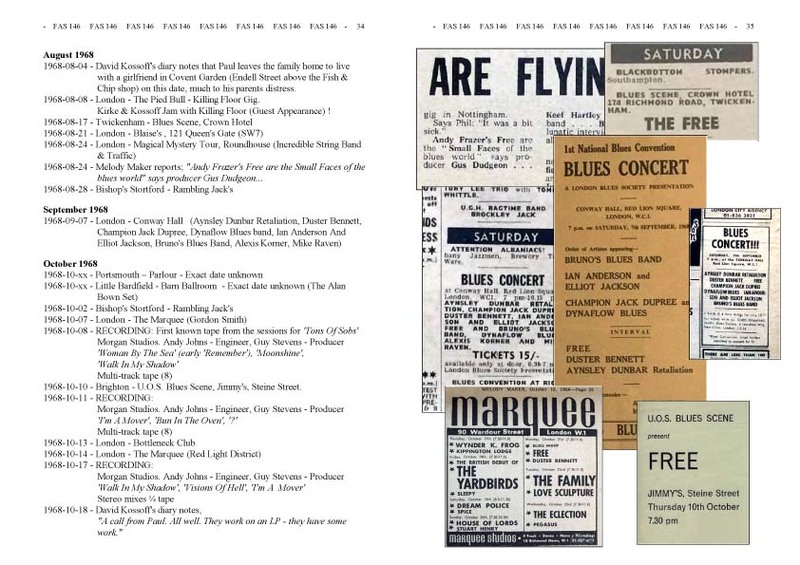 Also included are 4 photographs taken at The Adelphi Cinema in Slough, where the band were supporting The Who, along with Joe Cocker, Small Faces and Arthur Brown on November 9th, 1968. These combined represent the earliest 'live' images of the band EVER. There are 62 photographs in total, around 6 have been used in the FAS and 'Heavy Load' in the past, the rest are previously unpublished in any form, anywhere. Of these 46 are reproduced here full page, one of those being spread over the centre of the magazine. All images are b/w and Ⓒ Simon Kossoff. Back cover features the original 'Angel' advert for the forthcoming release of the 'Sobs' album in March 1969. 56 AWESOME pages. A teaser below. Get it now!! Paul Kossoff. 43 Years Today. Its not enough that we have Andy's anniversary in March but of course we also have the older one. 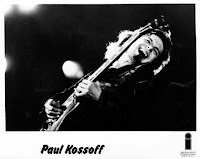 That of Paul Kossoff. A frightening 43 years! So time again to pull something out of Paul's today and give it a whirl. I'm going to be listening to KKTR this morning and, as its my favourite album PERIOD, I'll enjoy that very much. But here's something a little different. Below for your enjoyment is the unreleased single version of 'All The Girl's Are Crazy' from a single sided test pressing I have. The flipside ('Stealing My Way') also comes on its own 1-sided 7" test disc. That's as far as it ever got. 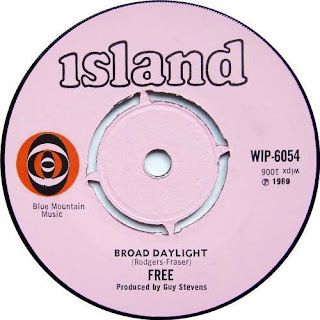 This was due to be released by Island Records, and on the back of the sleeve the WIPX-1389-2M number is indeed Island catalogue. This test pressing, done at Sterling Sound and was made on 20th May 1975 it appears. Of course Back Street Crawler went on to be signed to Atlantic/Atco and so this never came out. Its a different mix, somewhat rougher than the one on the 'Band Plays On' album, and it has a different vocal along with some alternate guitar. Its very nice, and you won't have heard this version anywhere else before. I've tried a number of times to get some kind of Back Street Crawler project off the ground with no success. 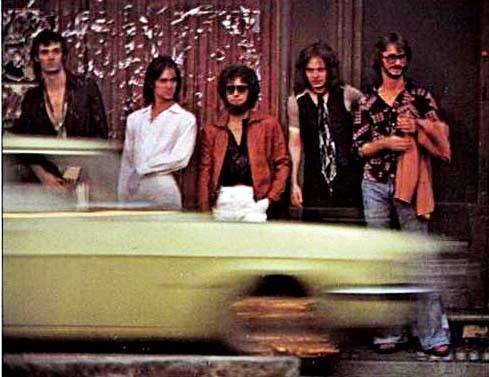 I'm not sure what there is sitting in the Atlantic archive but certainly there are some rehearsal tapes and unreleased songs that would make for a nice set of material covering the band history, brief as it was. Anyway, Kossoff is in fine form here with some great playing. So turn it up and enjoy. We miss you Koss. Extra Large 56 page issue covering the complete history of the band from April 1968 to March 1969. This includes releases by Champion Jack Dupree and Martha Velez up to the eventual release of the debut FREE album, 'Tons Of Sobs'. 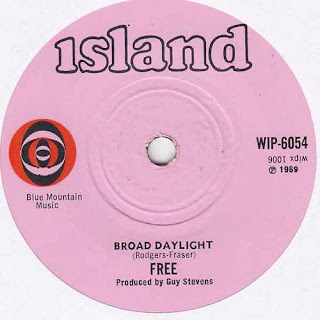 Featured are press releases, adverts, foreign issues, albums, singles and compilations. This history runs the day to day life of the band - including gigs and recording. The most in depth look at this period of the FREE history EVER. This is the first part of a trio of issues that look at this specific period of the band evolution over #144, #145 and #146. 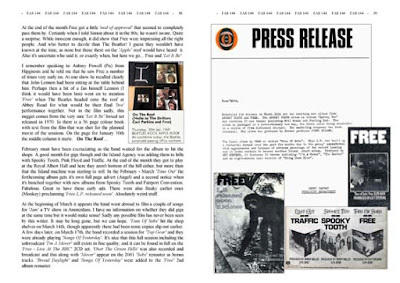 Back cover features the original shop poster advertising the release of the 'Sobs' album in March 1969. Much more memorabilia, photographs. press and cuttings inside. March this year is certainly busy. With the other two 'Tons Of Sobs' anniversary issues all due to go out in the next couple of weeks I don't think I've ever done so much at one time. Its very sad Andy didn't live to celebrate 50 years of the FREE debut. Certainly it was only in the final couple of years he really came to terms with how much FREE meant to people after a long time of dismissing what he did 'then' for what he was doing 'now'. He's been gone four years today, and while that makes me rather sad lets not dwell on it and celebrate something he did. 'Train Of Love' actually featured on Andy's second solo album, 'In Your Eyes', where it is given a very 'soul lite' treatment. Nothing wrong with that. I like the album. However the song was actually originally covered by the much more bombastic fantastic Andy Fraser Band. Fuzz Wah Bass indeed !! I love this band. They rocked! Nick Judd and Kim Turner were great in this tough little unit and the single album they released still sounds like nothing else. They didn't record the 'Train Of Love' track in the studio but they did perform it on the tour and also here on the John Peel BBC session from April 1975. Enjoy. Below that you'll find one of Andy's final pieces, 'The Big One'. I didn't like 'Naked.. And Finally Free' at all. I still don't. Andy knew that. We had talked about it and had a conversation about where he was then (Free) and where he was now, musically. When 'The Big One' came out, I loved it, and I still love it. Great groove, and a bit of a return to form I thought. I sent an email telling him. He shot an email back. "Yeah Dave, I knew I'd get ya!". I think that was perhaps the last time I heard from him. I'm so pleased we ended our friendship on a positive note - because Andy was a positive guy. Tons Of Sobs - 50 Years Old Today. Welcome to the Free Appreciation Society Blogspot. This site is an extension of the FAS magazine, which was established in 1979. Here you’ll find some of the articles from the magazine along with things that can’t be included, like video and interviews. It won’t be updated daily, weekly or even monthly but when there is something interesting to put up, or I have time, I’ll try and keep it interesting. If you’ve just found the site and are interested in the FAS magazine you can email for subscription details to fasarticle@aol.com. Thanks very much.